Gå tilbake i tid med et besøk til det berømte arkeologiske stedet Pompeii, og deretter vandre vulkanen som forårsaket ødeleggelsen. 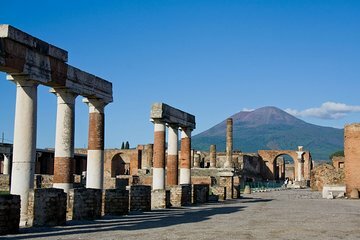 Spaser de gamle romerske gatene i Pompeii med en kunnskapsrik guide. Klatre til det vulkanske krateret av Mt Vesuvius for fantastisk utsikt over landskapet og Napoli-bukta. This was a good tour but the travel time to Pompeii was too long. Too many stops to pick people up and traffic was heavy. Only at Pompeii for 1 hr and 40 min. Mt. Vesuvius was great. The trail up is pretty steep but definitively doable for all ages. My wife did not want to do this but was very happy afterwards. Again, an OK tour just too much time in a bus. Maybe private tour would be better?? Our Guide Teresa was excellent! Great amount of time in each location with a break for lunch in the middle. This tour definitely exceeded my expectations! Very informative tour. Our guide Roberta was excellent. She was very informative and pleasant. Her singing of familiar Italian songs and asking the tour members to join in the singing made the trip especially enjoyable. Loved this tour. Bus was v comfy, tour guide was amazing. She was so informative and friendly. Plenty of time in both places. We didn't bother signing up for the optional lunch on the day as it felt a bit like get the tourists in and get them out, but couldn't fault the actual trip. Viator has delivered yet again. Excellent tour. Our guide was very knowledgable and the hike to the top of Mt. Vesuvius was amazing. Great tour. Be fit for the Vesuvius accent. My Vesuvius was incredible, the views were great. It’s a bit of a walk- it’s a volcano- I wassuprised many of the other tourists didn’t want to hike it... Pompeii was neat but it was a long tour and not my thing. It was great but I wish we had had a bit more time at Pompeii! This was a long day but well worth it! Our guide Lia and driver Salvatore helped us have a truly memorable experience. There were about 36 of us on this trip. We received lanyards to wear for our day so that we could be identified and had Lias phone number on if we got separated or wanted to branch off for a bit and do our own thing which a couple in our party did. From the start of the trip Lia used the microphone to tell us all about the itinerary of the day and the history of the regions as we passed through. We went straight to Mount Vesuvius where we gave her the admission money on the coach and she went ahead and paid for us as one group which saved all the hassle of paying individually at the gate the website details clearly said which excursions needed separate payment so there were no surprises on our account today. The trek up and down took about an hour so the timings worked out well. We had fabulous views on this October warm day. I only needed shorts and t-shirt but was glad of the sturdy trainers I wore as several people were sliding and slipping in their poorly-chosen footwear. From here we went to the restaurant in the centre of modern Pompeii. Again, this was advertised on the website so it was no surprise. There was no obligation to come in a few decided to go off and meet us again in one hour but we were happy with the value on offer 14 for a selection of 6 possible meals including 1 drink and 1 pudding. The rest of the afternoon was exploring Pompeii. Lia again collected our money and paid for us in one group. Saved loads of time. We all wore earphones as she talked to us through the ruins with her radio mic. Without this we would not have a clue about what we were looking at as there are hardly any explanation signs around the city. We spent 2 hours and it was enough in the heat even in October! Going on an organised tour was so much worth the effort and we thank Lia for her insights. This is a full day tour which started in a very nerve-wracking way-there were ten large buses leaving for Pompeii at about the same time. And we all had no way of knowing which bus we were on! No signs on the front that said Viator, only a facilitator yelling the names of people he had on his list! It was craziness ... but we eventually found our bus and boarded. From the moment we left the parking area in Sorrento though, we met our guide Teresa and driver Salvatore who were extremely professional and informative. Both knew the roads and history and got us to the site safely and as prompt as possible. Teresa was a terrific guide throughout our day, with clear instructions on meeting places, recommendations for lunch, and even a little humor from time to time. We don't do many excursions as a general rule, but we were glad we did this one!